I guess in hindsight, to get 14 overs of cricket yesterday at Hambantotta was a bonus in itself. We’d arrived in the Southernmost District of Sri Lanka the previous day only to witness a night almost entirely full of rain showers. There wasn’t enough evidence of sunshine to support the thought of the ground drying up, but we probably didn’t end up giving this a thought. So we found ourselves on a taxi to the stadium, the Mahinda Rajapaksa International Stadium – the newest of its kind in the nation. The misnomer here is that the stadium is not located in Hambantotta – but a good 45 km away from the town. The ground seemed a very modern arena, although the rain gods didn’t show any mercy the moment we crossed the security check. We were surprised to find that the entire playing area had been covered; therefore removing any lingering doubts over the time it might take to get the ground dried up. The rain, merely, had to stop for play to commence. 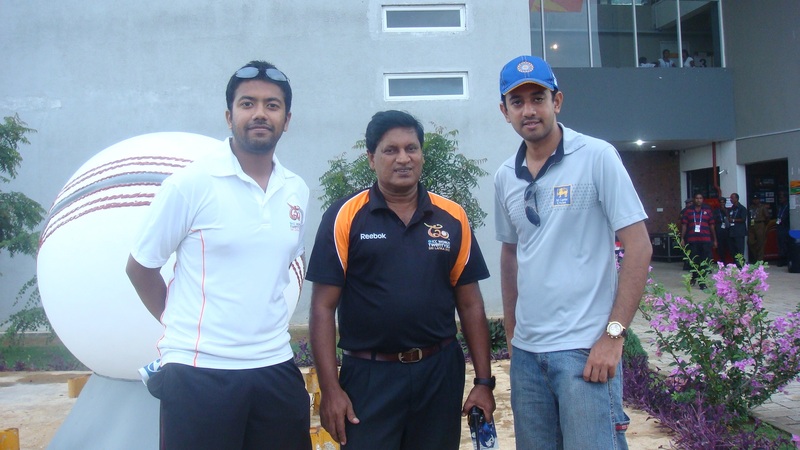 We’d managed to get an appointment with Ranjan Paranavitana, a popular Premier Division coach and journalist in Sri Lanka, who’d coached the likes of Tillakaratne Dilshan, and Dilshan Munaweera – current Sri Lankan internationals. We took a detour to the Press Box, rather to the building where it was, and met him outside the Media Box Complex. Ranjan, in a chat with Goutham Chakravarthi, mentions his delight on how the tournament has been panning out so far. He seems pleased with the level of interest generated amongst the younger locals – a factor that he highlights as one of the key motives behind the tournament. His dream, clearly, is to groom more youngsters who can step in to the international arena and perform for Sri Lanka. In particular, he singles out Dilshan Munaweera’s rise to fame through a string of outstanding domestic (and SLPL) performances. He is certain in suggesting that the youngster is likely to have a long stint at the international level – unlike other young, promising cricketers who’ve historically played the game of musical chairs. On the other hand, he feels that it was a mistake to not take Akila Dhananjaya, the young mystery teenage spinner, to Australia for the Under-19 World Cup. Dhananjaya’s story is well documented – a kid who was hand-picked by Mahela Jayawardene while the latter was observing the youngster bowling in the nets. Dhananjaya is yet to play a first class game for his province – a tale that would remind Indian fans of a certain selection of Parthiv Patel almost a decade ago. Although Ranjan is extremely excited by the potential Dhananjaya has, the speed of his rise, he feels, may be an inhibitor in times to come – especially during the longer formats. The premature influx of cricketers in to the international setup (via camouflages in IPL, local T20 leagues), for one, is an argument that Indians have probably done more to precipitate than any other nation around. But that doesn’t deter Ranjan from having the confidence in the young spinner to succeed at the highest level, albeit extenuating circumstances. When asked on his favourite team to lift the trophy this tournament, he picks South Africa, India and Pakistan as the teams to watch out for – other than his home country. Specifically, when requested to pick a favourite, he mentions Pakistan without a hesitation. On their day, as we all know, they can be world beaters. We signed off around the time we suspected play might begin and Ranjan graciously handed over an autographed copy of his book to Goutham, in appreciation of his efforts to get in touch with him and drive all the way to Hambantotta for a chat. On that note, we headed back to our stand hoping to catch some action. 79 was always going to be a challenging target in a 7 over game. 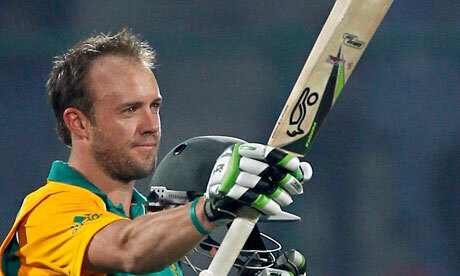 Skipper AB De Villiers’ blitzkrieg innings tipped the scales to favour a South African win. Munaweera’s catch of Richard Levi, in the first over of the game seemed to have got the home fans’ spirits up – given what we know of Richard Levi and his devastating hitting. Shorter the format, more valubale are players like Levi. Nothing much happened when the Sri Lankan innings got under way. Oh, we know there was a lot of music and cheering from the local fans – but unfortunately, in games of reduced formats, there isn’t too much of a room for percentage cricket. The odd boundary was cheered for, but the game slipped away from the home team with every ball bowled. It was a convincing victory all right, but in a 7 over a side game, you must be mad (or possess voodoo magic) to place bets. P.S. The video of Goutham chatting with Ranjan will be uploaded shortly.